I'm in a few local Facebook groups (Charlotte Harbor, Pine Island Sound). I've been seeing some posts of people getting Gag Grouper Inshore. It seems the trick is finding a good rock/debris pile. I tried drifting Quarantine rocks, no luck. Any tips / advice on how to get some inshore Gags before the season ends? You may have some luck on the NW corner of Patricio Island,it's a nice deep edge and is close to BG. I caught a 29" gag there last month. Thanks. I appreciate the tip! For example, how far do the grouper come in from the passes? Should I stay close to the passes or do they come all the way to Matlacha pass? I know they are in rock piles, but if I can’t find rock/ledges, what else should I look for - deep cuts, docks (near the pass), ICW, etc. Any deep water around structure will hold them. Deep docks near passes, rock piles, bridges, etc. They will go pretty far inshore, have gotten plenty in the river. They're pretty aggressive fish, just drop a pinfish down and give it 10 minutes, you'll know if ones there. I also do really well using hogy 10" baits on a 1 oz jig. An 18" grouper will smash it. 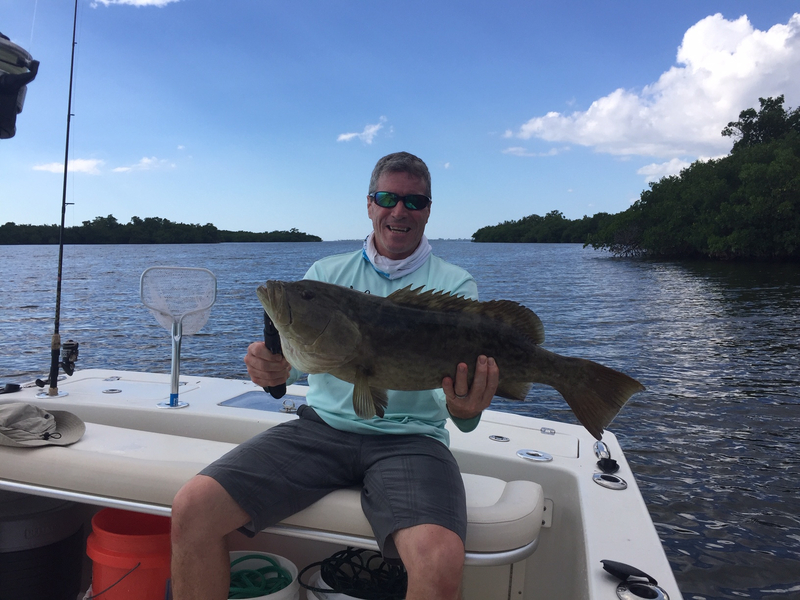 The trick we have found to catch the keeper inshore fish is the same as you would do offshore: find structure in relatively deeper water and chum heavily. My son and I took this batch in the oyster bars south of Sword Point, in about 8 feet of water, a couple of years ago, prior to the algae situation. We used both frozen chum and a chum churn, waited about 30 minutes, then had to wade through a couple dozen small snapper and catfish to get to the bigger ones. It was at night, on a full moon and a roaring tide. That gag taped in at a hair over 25". We released about 6 shorts, over 20 inches, and a bunch of don't-bother-to-measure gags. All the snapper kept were at least 12". 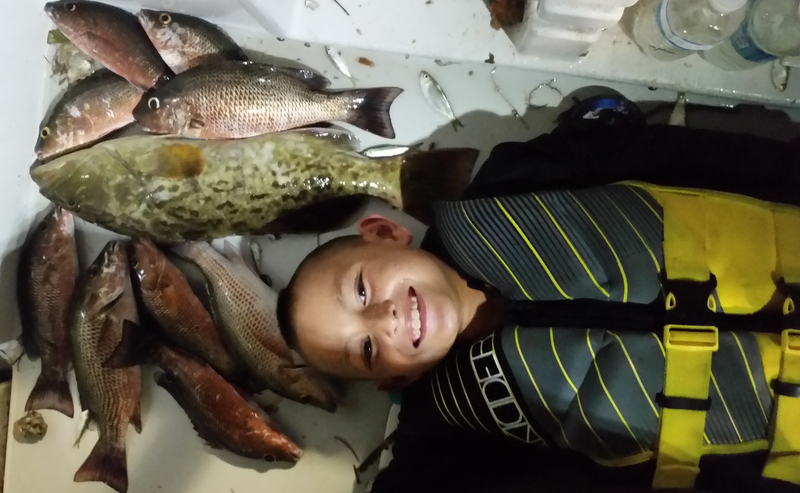 Most of the snapper and sub 20" grouper were caught on shrimp or whitebait. The larger snapper and keeper gag was on a bigger chunk of ladyfish (deal with lots of pecking until the rod bends). Haven't done that in a while. May have to try again soon. At night with your son, that will be a night he will never forget. I have a very vivid memory of fishing on lake Erie with my father on a head boat. It was when the Blue pike were still very abundant. You could see the glow of other head boats on the water ,It was the best of times with my dad. Thank you Dad. Try trolling BIG bomber or rapala plugs along the deep drop offs, you'll know quickly whether you snagged bottom or hooked a gag. I used to do this a few years ago before I moved. I've done this in your area and Fort Pierce with consistent success.